In April 2018, Ofgem announced a new energy regulation designed to assist Distribution Network Operators (DNOs) to balance out network usage and reduce the likelihood of sudden surges in demand. This legislation is known as Distribution Change Proposal 161. DCP161 works by levying a financial penalty to businesses that use more electricity than their Supply Capacity (kVA) is set at. This affects all businesses that operate half-hourly (HH) meters. These charges are levied by your DNO and covers the cost of supplying energy from the pylon to your site. The charges are part of the Distribution Use of System (DUoS) fee found on your bill. If you breach your contracted electricity Supply Capacity you will be charged an Excess Capacity Charge. 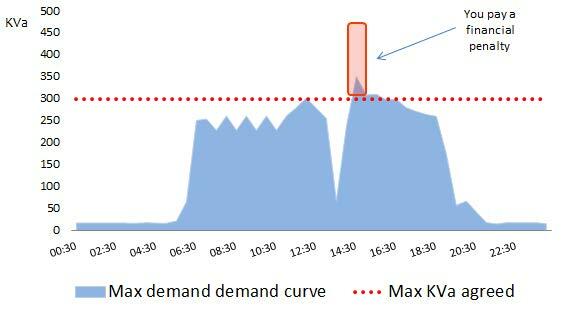 How much the Excess Capacity Charge is depends on where you’re based in the UK, but it can be as much as 126% of your Available Charge Capacity. Additionally, if you are using less than 50% of your Supply Capacity, then you are paying for a supply you don’t need. If this is the case, reducing capacity levels to one appropriate for your usage can save you money. Before DCP161 was introduced, if you went above your Supply Capacity you would pay the same rate for the additional electricity you consumed. Now, if you go above your Supply Capacity, you will be charged a financial penalty for the duration you are above your Supply Capacity. Reviewing your usage against your Supply Capacity to see if your limit is correct (and get it changed if it isn’t). Designing an energy management strategy suitable for your needs. Call us to today on 0207 371 5360 to find out how Advantage Utilities can help you avoid Excess Capacity Charges.